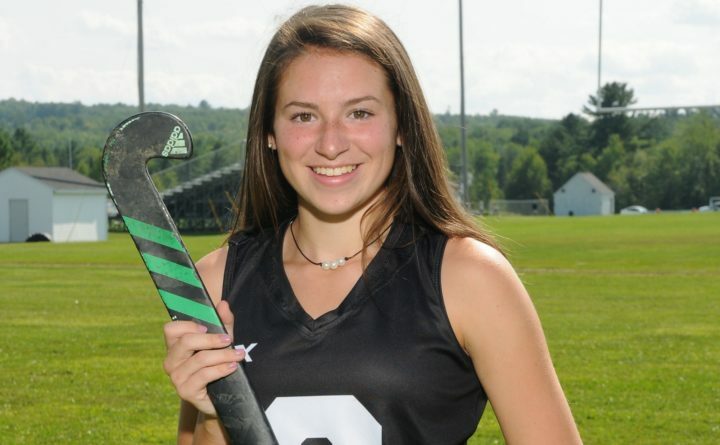 Bhreagh Kennedy of Skowhegan High School has committed to accept a field hockey scholarship from the University of Maine beginning in 2020. Skowhegan High School Hall of Fame field hockey coach Paula Doughty compared junior midfielder Bhreagh Kennedy to Nicole Sevey, who not only starred at Skowhegan but also put together an exceptional four-year career at the University of Maine. Sevey was a second team All-American her senior year at UMaine. Kennedy is looking forward to beginning her career at UMaine beginning in the fall of 2020. She has verbally committed to the Black Bears and will be a scholarship player. “It’s a great opportunity. I’m super excited,” said the 16-year-old Kennedy, whose team was beaten by Biddeford in the Class A state final on Saturday. “It’s a great program and there is a team atmosphere. They are all super close and the coaches are amazing. They made me feel so welcome. It seems like a great fit for me,” Kennedy said. UMaine head coach Josette Babineau is prohibited by NCAA rules from discussing a recruit until the school has signed a National Letter of Intent. Doughty said there is no question in her mind that Kennedy is going to be a valuable addition to the UMaine program. Doughty added that Kennedy is unselfish. “She has no sense of self-importance. She is totally focused on the team,” Doughty said. Kennedy registered eight goals and eight assists this season, and Doughty said she can play forward and center back in addition to midfield. Doughty said Kennedy occasionally spelled Miss Maine Field Hockey finalist Lizzie York at center back. Kennedy said she also liked the fact there are eight Maine natives on the Black Bears’ roster this season. The speedy 5-foot-2 Kennedy plays club field hockey for the Waterville-based Majestix and for the Massachusetts-based Futures program. She played in a national tournament for the Futures’ U16 team last year. Kennedy said she hopes to continue to improve and get stronger as a player. Kennedy’s participation at UMaine is contingent upon her being accepted into the school and meeting NCAA eligibility requirements.